Rubber Room Ramblings: PATTERN FOR 3x3 BOX ON THE WATCH IT WEDNESDAY VIDEO! PATTERN FOR 3x3 BOX ON THE WATCH IT WEDNESDAY VIDEO! Here is the pattern for the 3x3 box featured in my Watch It Wednesday Video! You need to cut your card stock to 6" x 5 1/2". Put your 6" side across the bottom of you paper cutter and score at 2 3/8" and 3 5/8". Then flip your card stock and put the 5 1/2" on the bottom edge of the paper cutter and score 1 1/8" in from both sides. Then cut the score lines on your 6" side up to the 1 1/8" score line on both sides. AND THERE IS YOUR BOX! Refer to the video for assembly instructions. Want to add a lid to your box? Here is the pattern for that. Cut your card stock 3 1/4" x 2 3/4". 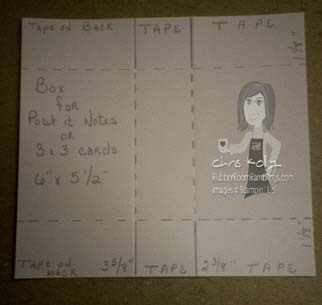 Put the 2 3/4" side on the bottom of your paper cutter and score at 1/2" and 1 3/4". 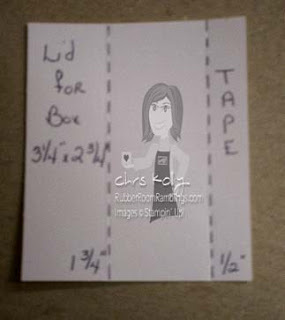 You will tape the 1/2" side to the inside or outside (whichever you prefer) back of your box. THIS IS SUPER EASY AND SO VERSATILE! !